After one too many daydreams about pastries blogger Kristin Rosenau quit graduate school to focus more on flour and sugar. The Blog: Sweets-obsessed Kristin Rosenau of Pastry Affair is now a science teacher by day and obsessive baker by night. If you don’t mind, could you tell me a little more about how pastries stole your heart and whether you are baking as a career outside of the blog? I first got into baking three years ago when I started a food blog on a whim. Fresh out of university, I needed a creative outlet to find myself again. Even though I had no baking experience and had rarely used a camera, I figured I would teach myself anything I needed to know along the way. And so the adventure began. Though a bit backwards, I fell in love with baking after I began blogging. The fall was fast and hard and all-encompassing. 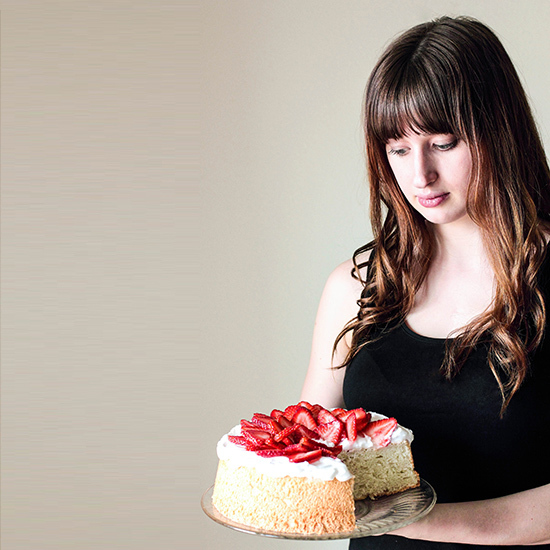 After six months of baking and blogging, I quit graduate school to work in a small pâtisserie. It was wonderful, for a time. Even though I loved the idea of working in a bakery, the reality did not match what I had envisioned in my daydreams. The truth was that I loved my own kitchen and the freedom it provided more than the hustle and bustle of bakery life. The decision was tough, but I decided to move forward. I now work as a high school science teacher and could not be happier with where I am. I spend my days in the classroom and my weekends in the kitchen and for now that is just right for me. From where do you draw your inspiration for your baked goods? Inspiration comes to me in all forms, whether I’m paging through an old cookbook, riffling through fresh fruit at the market, or watching the weather change outside the window. The bright colors and shadows of spring are currently capturing my attention, as I find myself drawn to honest and rustic recipes. I like to make desserts that can be shared with loved ones—simple sweets that are no worry or fuss, but still show that I care. Inspiration is a unique creature and I always welcome a visit. Are there any pastry challenges you have not yet mastered and want to? The French macaron eludes me. Often considered one of the most difficult pastries to master, its foreboding reputation has held true for me. I have tried to make macarons a dozen times over the past two years, using a handful of different recipes. So far, there has been no luck. Even though the cracked tops and lack of feet of my macarons may not be charming to look at, they still taste delicious. I’ll happily munch away at the rejects until I can decode the secret of this of challenging little pastry. What ingredients are you really obsessed with right now? Coconut and cacao nibs. Since I discovered I was lactose intolerant a couple years ago, coconut has been the ideal dairy-substitute simply because of its phenomenal number of uses. I use coconut milk as a base for all of my ice cream and pudding recipes. Coconut oil works well as a butter substitute in scones and cookies. More recently, I have been putting whipped coconut cream on just about every dessert that comes out of my kitchen. Coconut has become an obsession to rival my love of chocolate (something I never considered possible before now). Cacao nibs are a slightly more controversial ingredient. When I tried my first handful, they tasted too bitter for me to enjoy. I put the bag back in the cupboard and forgot about them until I needed a last minute ingredient in a batch of muffins. The cacao nibs transformed in those muffins, losing all bitter tones and taking on a rich chocolate flavor. Since then, I have eased myself into their flavor, savored in baked goods as well as eaten plain. Each morning, I toss a few in my morning bowl of breakfast quinoa to start the day. What blogs are you most excited about right now? I discovered Emma’s blog, Poires au Chocolat, soon after starting my own. She mixes simplicity and honesty with ease and grace, making it feel as if I am in the kitchen alongside her. Top With Cinnamon is one of my favorite blogs to peruse on a Sunday afternoon. Izy’s photographs are absolutely breathtaking and her unique flavor combinations are both decadent and refreshing. My Name is Yeh is the newest addition to my list. I adore Molly’s fun and bright approach to life and food. I’m excited to see what she comes up with next.